I will remember that day, that moment for the rest of my life. I walked into my Mom’s kitchen, wondering why the front door was open, when I saw them. My brother, Alan, holding a knife to my mother’s throat! I screamed long and hard and almost passed out. Alan dropped the knife and fell to the floor, while I ran to grab my mother. She was in shock and I gently guided her to the sofa. While Alan lay sobbing on the floor, I went to call 911. How had things come to this? How had my loving brother turned into this monster? And how long was my mother going to protect Alan by lying to herself and all of us? And how much longer would we keep blaming each other for Alan’s alcholism. Mom and Dad, madly in love, got married in their early twenties. And before they knew, my sister Sharon was on the way. Dad worked hard at his sales job while Mom, gave up her job as a secretary to look after Sharon when she was born. A year later, they had Alan. I remember watching a home video of the four of them together. Mom and Dad, so in love still, Sharon, aged 5, walking around and acting the big sister, and Alan seemed permanently perched on Dad’s shoulder. Alan was Daddy’s little boy, alright. I watched that video with envy, because I never knew my Dad. He died in a tragic accident, leaving Mom to take care of Sharon, aged 6, Alan, aged 5, and me a baby in the womb. How she coped with us all, I’ll never know. She managed on the insurance money till I was ready to go to school, taking typing work at home, and then started working again. Sharon was almost 7 years older than me and had no patience with me. But Alan, was always there for me – a big brother, trying hard to live up to Mom’s reminders – ‘You’re the man of the house, Alan.’ I’m sure sure they all missed Dad more than they said, but were careful not to make me feel left out of their memories. Sharon did reasonably well in school as did I. But Alan was the star – good at academics, shining in sports and just a wonderful role model for his siblings, friends and team-mates. Little did we all realize what a pyschological burden we were placing on Alan, when we all expected him to be perfect. Little did we know that he suffered from low-esteem, missed having a father figure in his life, and tried so hard to grow up before his time. But we would soon find out that Alan couldn’t take this pressure any more. Things changed dramatically when Alan was 17. He had been dating a girl who none of us really liked. At 21, she was older than him, had dropped out of school and rumours were that she was often seen in bars during the day time. Suddenly, Alan started skipping school ever so often. A couple of times he didn’t show up for his game. When the Principal and the coach called my Mom in to let her know, she acted as if it was she who had given Alan permission to stay home. Sharon and I knew he hadn’t been at home during those times. We heard Mom arguing with Alan after those meetings but didn’t know the details. At the end of the argument, Alan would walk out of the house in a huff and come back way past our bedtime. Sharon and I were scared for him, but when we asked him what he was up to, he’d tell us to get lost. Mom would tell us that it was just a phase he was going through. Alan dropped out of school a few months later, supposedly to get a job. We wondered why, if Alan was working, did we often see our mother giving him money. Alan always had an excuse for losing his job and for coming home late much the worse for drink. While Sharon and I had learned to keep our thoughts to ourself, Mom constantly justified his actions, telling us that he would settle down soon. Four years later, we watched sometimes helplessly as Alan seemed to be drunk most of the day. By then, Sharon and I had jobs and had moved to our own apartments. Every once in a while, Alan would go off the drink and peace would reign for a few days. Mom would report this with much pride, only to have to tell us a few days later that he was back to drinking! Drama, tears, fear, helplessness and the pain of watching Alan go down the tube before our eyes! It filled me with desolation and I threw myself into work all the more to forget it all. Now matters had come to a head. Once Alan was released from prison, he started hitting the bottle again. I knew we had to reach out for professional help. Who knew what he’d do next. I contacted a counsellor who recommended that we go in for family therapy. Alan refused to come, telling us he had no problem. Mom, Sharon and I went. We had no choice. We had to act to save Alan and our family. Through therapy, we all realized how we were codependents, keeping Alan addicted, by the way we acted towards him. For Mom, this realization was huge. As we all worked through our situation, we knew we had to have a family intervention to get Alan into rehab. We managed to get Alan to attend a Sunday lunch to which we invited our therapist and a few members of the extended family. Our therapist had suggested we all write Alan a letter telling him how we felt and giving him an ulimatum – get clean or lose your family. It was hard writing those letters, even harder reading them out to him. Tears, fear of losing our brother, sheer fright that he’d choose his addiction over his family……..But thankfully, Alan reluctantly agreed to get help. We had researched facilities for Alan to go into. Hanley Center at Origins had the staff and facility that we were looking for. They came highly recommended. Alan checked into rehab. A whole new chapter started for him and for us as a family. I can’t tell you how much peace this process and decision has brought my mother most of all. Knowing that he son is being well looked after and that he’s working towards recovery, has given her a new lease of life. She looks years younger already! Sharon and I too are so much more at peace, knowing that things are looking up for Alan. We all continue with family therapy. We, as a family, are aware that addiction is a disease that Alan and we will have to live with, but we’re confident we’ll beat that monster! This is a work of fiction. However, it could be true of so many families. We must realize that addiction is not a character flaw or something to be ashamed of. It’s a disease and must be treated as one. Sadly, this disease causes great changes in family dynamics and great pain for everyone. It’s important for families of addicts to get help for the individual and for the whole family. 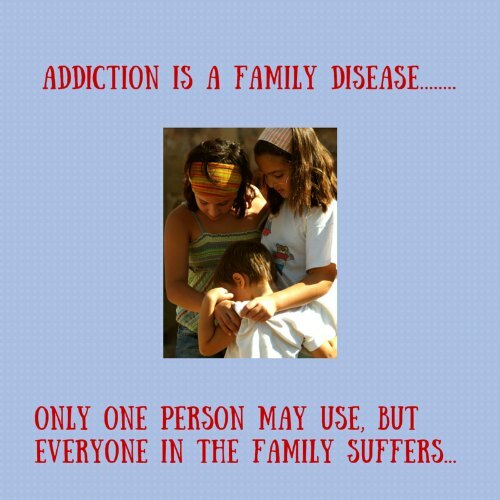 Do you agree that addiction is a family disease? This post touches home in many ways. I have somehow managed to surround myself with addicts my entire life. Father, husbands,grandparents and children. It is a horrible disease that ruins families and even if you are aware you are at risk it can sneak up on you when you least expect it. Addiction comes in many forms and many people would be surprised to find out they are addicted to something they thought they just enjoyed a lot. You did a great job bringing it to life. I know someone whose brother is an alcoholic, and it has impacted the entire family. The man is now basically in the later stages of drinking himself to death. His father and his sisters have tried everything they can think of without success. They are familiar, so familiar, with the roller coaster you describe. When I read your post, it felt so realistic. I was relieved to read that, for you, it was fiction. But for so many others, it was not. Sad but true. How often we mould the members of our family to be addicted to alcohol, medication and food but isn’t it easier to blame others for our lack of control? That’s true, Sunita. However, it’s not about blame, but realizing that even those who are not addicted suffer the consequences are inadvertantly make things worse. Sad but true but aren’t we all products of our environment? We drive our family to all kinds of addictions right from over eating, to drinking and over indulging in so many things that can truly harm a family’s equilibrium. But on the other hand, isn’t it easy to blame others for our addictions? Debbie, this was inspired from my watching of several episodes of the Canadian show, Intervention! I’m sorry your family went through this too. The worst part is the children in such homes thinking that they’re alone through it all. So much of drama! May more families seek professional help. Corinne,this is such a sad story, but unfortunately in every family there is one Alan,who is addicted to drinking. I know, Mrs Menon. And then there are other addictions too – less obvious, but equally harmful!